I competed in the 2006 Winter Olympic Games in figure skating, and was the youngest athlete on the Canadian Olympic Team. Google is well known for having great engineering, so I've always wanted to learn from and be one of their software engineers. I also love how they value Googley-ness in their people and products, which makes for an awesome work environment. I work on the Analytics Config Services team, which is part of the backend of Google Analytics. The mechanism that my team currently uses for master election is being decommissioned, so my project is to re-implement leader election with a different service. The best part about working with my manager is that she helps me with my technical development, even outside of my project scope. She not only explained to me my project domain, but also the motivations that led to certain design and architectural decisions. This helped me better understand my project realm and make better engineering choices. My team is very welcoming and supportive. It's been great getting to know them all, and I really like the team spirit we have. Another terrific aspect about working here is GoogleServe, where Googlers get to take part in community projects for local charitable causes. I recently participated in a GoogleServe at Second Harvest Food Bank, and it felt wonderful to give back to the community. I'm happy about the current iteration of my project, because I've been able to bring together all the new concepts I've grasped so far at Google into a basic, functioning version of the final product. I’ve learned so much along the way that I can apply to the rest of my project. I'm really excited about my next step, which is to get the current version of my project to run on Google's systems. My interpretation of being Googley is putting the user and their best interests first, paying attention to details, coming up with efficient and optimal solutions, and improving continuously. It also means collaboration over competition and being ethical, and I feel that this results in amazing products. I think that passion for what you do, creativity, trying new things, and lifelong learning are Googley traits as well, and I love working in an environment that values these qualities. Be passionate. This will power you through your internship, especially since you are given a lot of responsibility and independence on your project. I think that great passion leads to great work, so if you love computer science and great engineering, then you should definitely apply. I’ve volunteered on our school’s CS Student Development committee and TA’ed a couple of CS courses. I also like listening to music and enjoy reading books. And of course, I love figure skating. Teamwork is very important in helping you work efficiently and improve your skills. My team has introduced me to a lot of new tools and systems that have helped me streamline my workflow, and code reviews are really polishing up my coding style. Orientation week at Mountain View was so much fun! I had a great time getting to know my fellow interns and taking classes. I'm really looking forward to our next event: whale watching at Newport Landing! 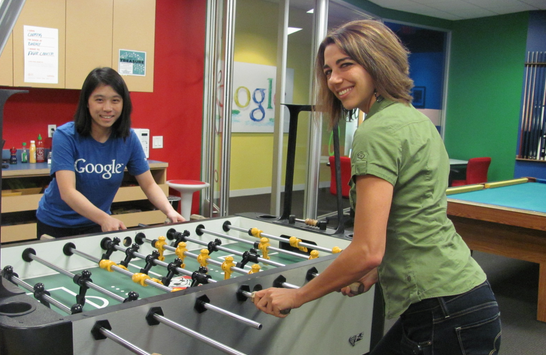 Mira’s Host, Ruth Doane, has been at Google since 2007. Before Google, Ruth had a very interesting background, spanning everything from gaming to working on microprocessor design. A yoga class at Google introduced Ruth to the joys of hot yoga, which she enjoys in her spare time, along with ballroom dance. Ruth is also passionate about giving back and serves as a Court Appointed Special Advocate for children. Ruth also knows 100+ digits of Pi. Ruth was compelled to host an intern because of how internships shaped her own career, and has enjoyed her time working with Mira so far. My background included a few other industries, including running a game startup with my husband, and writing custom software for microprocessor design. I learned from those experiences, but still had not figured out quite what I wanted to be when I grew up. When did you start working at Google? I joined Google in 2007, three years after the IPO. At the time, I felt like a latecomer, with so very much to learn in a fast moving environment. Seven years later, there is still much more to learn and do, but I have now been here longer than about 80% of the engineers. I work on Google Analytics, which helps web site owners gain insight about what brings visitors to their site and how the site is being used. The internships I did when I was in school benefited me enormously. After a few years of watching other people host interns, and taking on more responsibility myself, I finally felt ready to oversee what I hoped would be a great experience for an intern and a big value add to my team. My team takes on interesting modeling and scaling questions, has a role to play in most new Analytics features, and moves quickly while maintaining good code and project health. The best part, though, is the people I work with. Mira picks up complex concepts quickly, comes back with great questions, and is always curious to learn more. I enjoy getting into deep technical discussions with her, and then seeing the way she has synthesized and applied these disparate conversation threads to the work at hand. I’m a big fan of the food, massage, and fitness programs. I’ve used the latter for everything from bike maintenance workshops to Bollywood dance. I also have fantastic memories from team offsites, like rafting, ziplining, flight simulators, and scavenger hunts. My favorite perk, though, is the way Google seeks to give time and money to do good, and supports me in the same endeavor. There is a ridiculously generous donation match ($6,000 to non profits, with opportunities throughout the year to get several thousand more matched), and a community of people having meaningful discussions about how to direct money most effectively. There are also organized team volunteer events, along with amazing support for the ways I volunteer. I get extra paid time off to volunteer, and Google matches that time with a per-hour donation to the organization! I think being Googley is about the citizenship that makes our open culture possible, and that earns trust from users and from each other. We are empowered in so many ways to be productive, make good choices, and scale up. Whether it is free food, access to computational resources, or transparency from the leadership, we all need to respect the privilege in order to make it work. When we make collaborative choices to steward such information and resources well, rejecting arrogance and entitlement, that is being Googley. For our second installation of Intern Insights, meet Mira Leung. 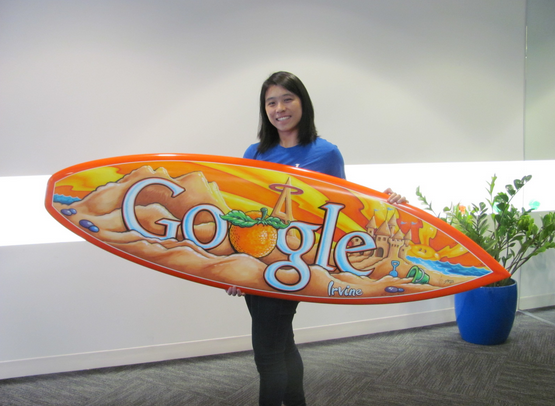 Mira is a Software Engineering Intern working on the Analytics Team in the Irvine Office. When Mira is not coding or TAing CS courses at the University of British Columbia, you can find her reading, listening to music and spending a lot of time figure skating - she was the youngest athlete on the 2006 Canadian Winter Olympics Team!